Smart image recognition systems can be incredibly powerful, and how interior designers and fashionistas can take advantage of them. Pinterest now has a tool that allows you to search not using words but images, which could make tracking down that artisanal teapot a little easier. In the past, Pinterest has required you to know how to describe something in words, which—if you’ve ever spent much time using the site, you’ll know—can actually be rather challenging. Now, though, when you spot something in a Pinned image, you can tap the search tool in the corner and select a part of the image, and then search using it rather than words. The site lets you filter the results, too—so you can sift out the designer waste paper bins from the similar-looking farmyard buckets, say. Perhaps just as importantly, it’ll help you find out where you can buy the damn thing, too. It’s a small addition, but it’s a neat one. And in many ways, this is the kind of site that always really needed visual search as a tool. 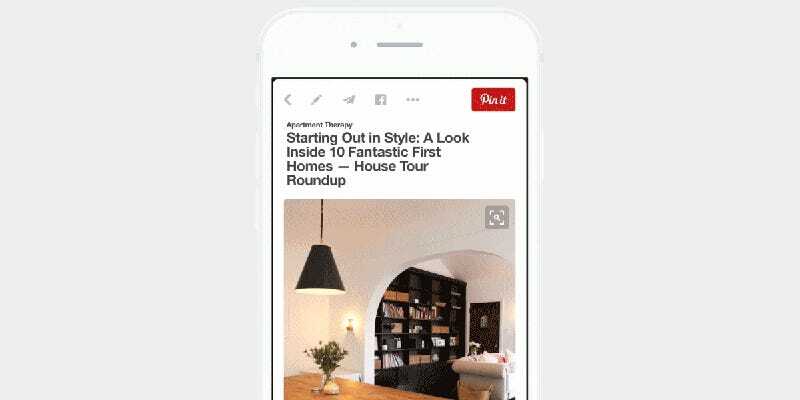 The update is now live on the site and in the updated app, but in the meantime, here are 10 tricks to help you use Pinterest even better.